MYRTLE BEACH, S.C. – No. 8 Tennessee routs Rider, 18-0, in a five-inning slugfest on Sunday to close out the Kickin’ Chicken Classic with a perfect 5-0 record. Nine different Lady Vols came around to score and six players scored at least twice in the contest. Aubrey Leach and Chelsea Seggern led UT with three hits apiece while Ashley Morgan drove in three of Tennessee’s runs. Kaili Phillips, Haley Bearden and Cailin Hannon all homered. In the first frame, the Lady Vols put six runs up on five hits and one error. Leach led off with a walk and scored on Seggern’s single to center while Amanda Ayala came home on Morgan’s single to left. Bearden then knocked a two-run homer to right before Savannah Huffstetler worked the count for a walk and scored on an error. 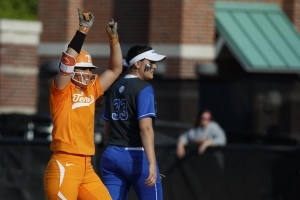 Tennessee went through the order for the second time as the Orange and White scratched seven runs across on seven hits and two errors in the second frame. Seggern kicked things off by doubling to center and scored on Ally Shipman’s single to the same spot. Phillips then reached on a fielder’s choice and scored thanks to Morgan’s second hit of the night. Bearden went on to score when Jenna Holcomb singled to left and Ayala plated two runs on UT’s third double of the inning. Leach rounded out scoring in the frame as she crossed home on a wild pitch. Scoring five times in the third, Tennessee drove in four runs on two homers and scored on a wild pitch. Rider was limited to just three runners throughout the game as Caylan Arnold dealt 4.0 shutout innings and eight strikeouts. Ashley Morgan came on in the fifth to close out the contest. She faced four batters in the outing. RUNS GALORE: Tennessee’s 18 runs vs. Rider are the most for the Lady Vols since they also scored 18 against Arkansas on March 11, 2016. CARREER-FIRSTS: Kaili Phillips and Cailin Hannon each hit their first-career home runs on Sunday. Phillips’ solo shot came in the second inning and Hannon sent a three-run blast to the palm trees behind center field in the third. UP NEXT: Tennessee heads south next for ESPN’s St. Pete/Clearwater Elite Invitational (2/15-17). 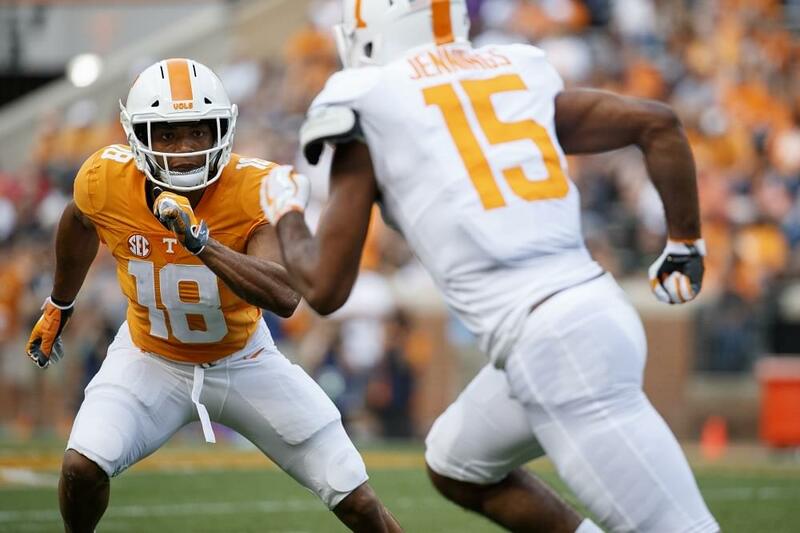 The Big Orange will take on Notre Dame (who received votes in both major preseason polls), No. 21/23 Minnesota, No. 23/22 James Madison, Utah and No. 1/3 Florida State.